From March to October the Ocoee River comes alive with whitewater enthusiasts from around the world who journey to shoot the world-class rapids in rafts, canoes, and kayaks. Outdoor adventure writer Kim Urquhart calls it "a paddler's paradise...loved for its size and power, constant flow rate and continuous waves and holes". The Class III and IV rapids that highlight this river begin just west of Ducktown, TN. The Ocoee Whitewater Center is a federally operated put-in that is used by both commercial companies and individuals. In 2002 nearly 300,000 people made the journey from this site to the take-out more than 5 miles further down the river. Escape to Blue Ridge Georgia and enjoy white water rafting, canoeing, kayaking, and even fishing on the beautiful Ocoee River. From March to October the Ocoee River comes alive and whitewater enthusiasts from around the world journey to the area to enjoy the world class rapids in rafts, canoes and kayaks. Learn more about the beautiful Ocoee River and the Ocoee Whitewater Center below, and be sure to check out our Ocoee River Cabins nearby to this phenomenal rafting river. The Ocoee River and the Toccoa River are actually the same river, however the Ocoee River is the section of the river that flows through Tennessee. This part of the river is extremely popular among rafting and kayaking enthusiasts and it is a main tributary of the Hiawassee River. The rapids and flow of the water are maintained by three dam systems controlled by the Tennessee Valley Authority. The TVA regularly publishes their water release schedules for the Ocoee River, so people wanting to enjoy Ocoee River Rafting will know exactly when the best time for rafting is. Most of the rapids on the Ocoee are between levels II and IV, however there are a few rapids that are larger at certain times in the release schedule. The Ocoee Whitewater Center, commonly called the OWC, was constructed on the Ocoee River in 1996 for the Summer Olympic Canoe, Kayak, and Slalom competitions. Builders constructed this large arena and brought in over 60,000 tons of native rocks, narrowing part of the Ocoee riverbed to create the fast flowing rapids that were needed for the competitions. 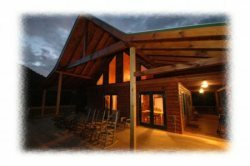 Because the Ocoee Whitewater Center is located inside the national forest, the National Forest Services manages and operates the center�s large recreational and educational complex. Today the Ocoee Whitewater Center is a thriving whitewater, fishing, and kayaking Mecca and several smaller whitewater competitions are held here each year. Visitors can enjoy other activities like hiking and biking as well. Drawing over 300,000 visitors a year, the Ocoee Whitewater Center is a popular Tennessee and North Georgia Attraction and a place full of stunning beauty. Enjoy a great Rafting Trip on the Ocoee River, stay in our Ocoee River Cabin Rentals in Blue Ridge Georgia, nearby to all of your favorite Things to Do in North Georgia.